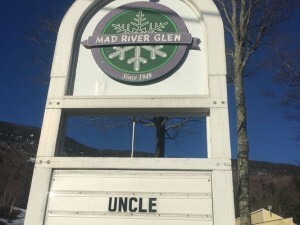 A couple of weeks back Mad River Glen announced that it was closing for the season after only 45 days of operation. The sign at the entrance to the ski area said it all in one word: “Uncle!” Yes, it’s been that kind of season. Many skiers and ski areas are looking ahead to next season, or even just summer, to put this season behind them. The reaction on social media to Mad River’s announcement was almost 100% positive from its loyal fans! Even people who never got to use their passes this season said they consider it a worthwhile “donation” to the area they love. All of this is a fulfillment of the vision that Mad River Glen’s founder, Roland Palmedo, had for the area. Ed Pearson correctly identified Roland Palmedo as the source of Mad River’s vision statement. I have written about Roland Palmedo in previous columns and how he helped establish Stowe as a skiing destination. This included his formation of the Mount Mansfield Lift Company that built the original single chair. Palmedo also gets credit for suggesting to the Mount Mansfield Ski Club that a fun ski race to end the season would be a good idea. The first Sugar Slalom was held in 1939 and that tradition will continue this weekend with competitors of all ages! Even though Palmedo was a driving force behind the development of Stowe as a ski resort, he wasn’t happy with the direction Stowe was heading. Palmedo was a serious skier who had “earned his turns” before there were lifts. Suddenly Stowe was attracting less serious skiers who wanted more lifts, easier trails, and more nightlife. Palmedo wrote “I can’t see that ski resorts need belly dancers, discotheques, and other side-show attractions.” Hmmm? Belly dancers in Stowe? World War II intervened and Palmedo, who was a pilot, would serve on the USS Yorktown. But even before he returned from the war, Palmedo had some of his Stowe crew, namely J. Negley Cooke and Charlie Lord, looking for a site for a new ski area. They would settle on General Stark Mountain in Fayston. While it was a relatively small mountain, it had a northern exposure, good terrain, the CCC had built a road that would allow access, and most importantly: it was all on private land! 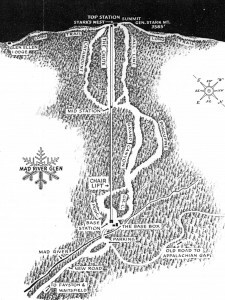 Palmedo and Cooke formed the Mad River Corporation and acquired all the land for the ski area as well as adjacent to the area. That way Palmedo could totally control the development. The adjacent house lots were only sold to people who shared Palemedo’s vision of a skiing community. 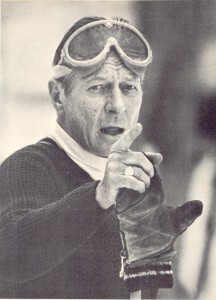 Charlie Lord helped design the first trails and would become the first area manager. A state-of-the-art single chair was installed which was the fastest in the world at that time. It was scheduled to be completed for the winter of 1947-48, but early snows delayed completion until the following year. 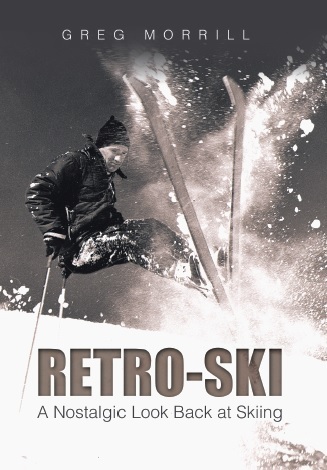 The official dedication was on December 11, 1948, although that was a low snow year so no skiing was available until January – sounds familiar, eh? The area became a success and through the 1950s and 60s, Palmedo oversaw growth in terms of the number of lifts and trails. But the area maintained its personality as a skiers’ mountain with challenging trails and even more challenging tree-skiing not reflected on any trail map. To Roland Palmedo skiing was more than a recreational sport, it was a spiritual endeavor. Skiing was an opportunity to respect nature – the weather and the mountain, not change it. 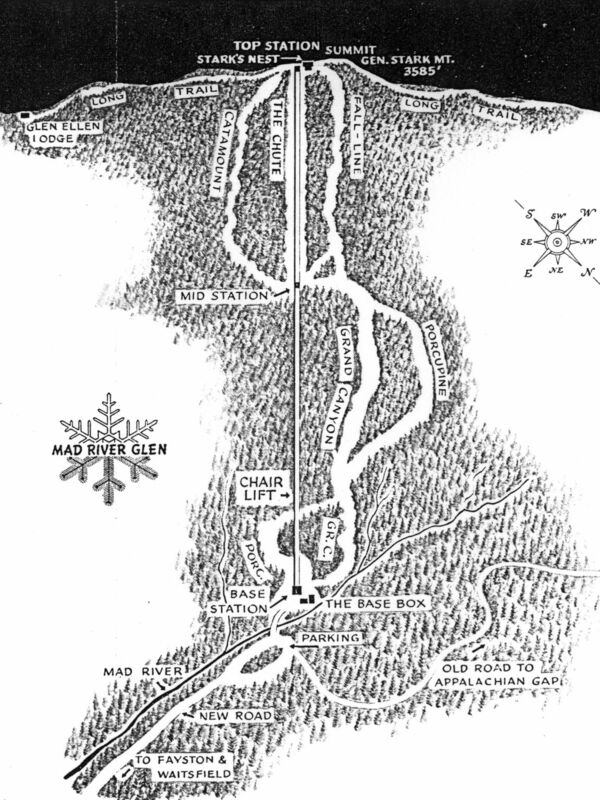 Mad River Glen remains a memorial to his vision of skiing.